Trying to escape the ghosts of her past, she is swept away to a house that breathes, bleeds...and remembers. I saw the Crimson Peak movie and really feel in love with the story. I sought this novelization to get more detail into the characters thoughts & feelings. This performance did not disappoint! Upon finishing this book, I again saw the movie with greater insight. My experience was enhanced, and I appreciated the story, setting, and cast even more. Guillermo del Toro is a master, his movie is now one of my favorites. This novelization is very well done, I felt completely immersed in this audio book, every detail available. Imogen Church is superior. I am not one for scary, suspenseful novels, but I was intrigued by this one. I enjoyed the storyline, though slow in some parts. I was pleased with the characters throughout the story. Additionally, I am a huge fan of Imogen Church's narratives. She has a way of bringing each character to life. I began reading this with the impression that it would be a ghost story, but it was so much more than that. The characters had such depth, and the plot was beautifully delivered. Great read for the Halloween season, or if you're simply in the mood for a darker tale. I watched the movie and found it to be pretty good so after reading others reviews, I thought I would give the audio book a go. I was not disappointed and the performance by the narrator was great and she captured emotions well. I think she excelled the most with the character of Lucille. After listening to the whole book I almost wonder if she wasn't the main character and not Edith. Overall, very pleased and I'd recommend it to others. This is a great book, slow start but then you can't turn it off. You wont regret it ! 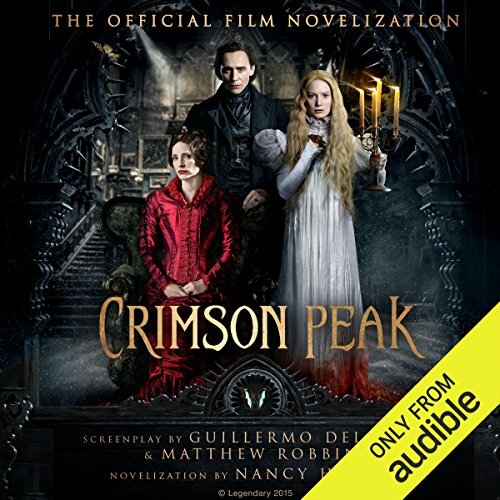 Would you consider the audio edition of Crimson Peak to be better than the print version? What does Imogen Church bring to the story that you wouldn’t experience if you just read the book? For the most part I did enjoy the narration. But in a few instances I felt the 'reading' was a bit choppy. In the beginning...no. But once Edith decided on her future...yes, I wanted to see what was going to happen next. I have listened/read better books in this genre, but I did enjoy the book and I am glad I used the credit. The characters matured and you got to feel them and how they felt...in the story. The cottonmouth makes this impossible to listen to. I love book, read it several times ... but I just can't listen to that cottonmouth. Wasn't anyone in the recording studio paying attention ? I am personally a fan of the movie and now I am of the book. very good in detail and I loved it. In the beginning the character developments and story are slow, but a good listen overall. Narrator does a great job. As usual the book was more enjoyable than the film, and the film was excellent!! I would recommend this to anyone who loves ghost stories and thrillers. the 'Twist' was a bit easy to see coming but it didn't make it any less enjoyable at all. I will sit down to watch the film after listening to this book and i know i'll listen to it more than once. The end scene, its action was almost palpable. A thoroughly riveting listen. A dark and beautifully Gothic work of horror by the master himself. And brilliantly novelized by Nancy Holder. In the tradition of Victorian Gothic romance.